If you are looking for a space saving, economical, high-quality machine to fit your budget, look no further. The revolutionary Baker P.A.Q. Band Resaw is the solution. Every component on the Baker P.A.Q. is designed and created using the latest technology in precision laser cut and CNC press break machinery and assembled using a simple bolt-together construction without any welds. A revolutionary Baker Octaguide System will increase guide wear up to eight times. The Baker P.A.Q. 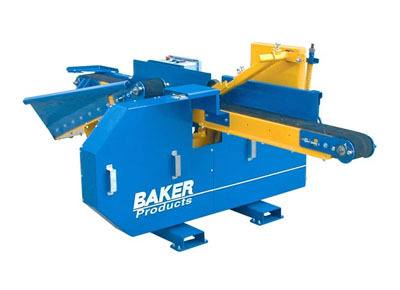 is available in two models and utilizes the same thin-kerf technology found in our world famous Baker Band Resaws. Because the conveyor belt stays at a fixed height, it is easier to integrate with other machinery in your facility. Shown with optimal return option above. Products specifications are subject to change without notice.